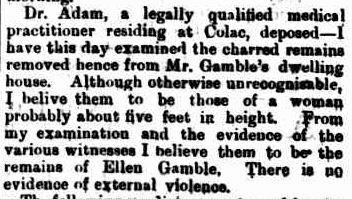 Recently I ordered some digitised Inquest records including those of my ggg grandmother Ellen Barry. 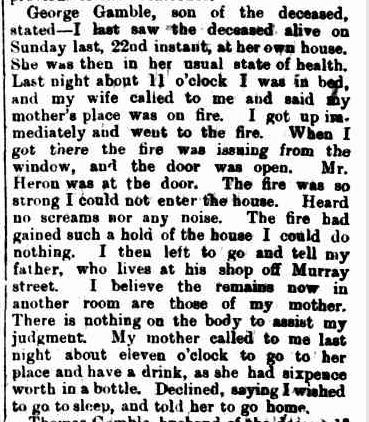 You may remember from the post A Tragic Night, Ellen burnt to death in a house fire, her drunkenness contributing to her demise. The first witness statement was from Dr Adam who examined Ellen’s badly charred body. Even though unrecognisable , he was able to show the body was a woman and she was around five feet tall. The next statement was from mounted Constable Charles Magor from the Colac Police station. By the time he arrived, the house had burnt to the ground. 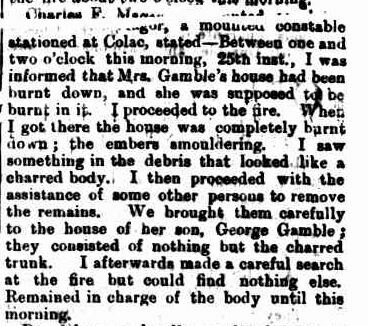 He found what looked like a body and removed it, “carefully” , I might add, to the home of Ellen’s son George Gamble who lived a few doors away. 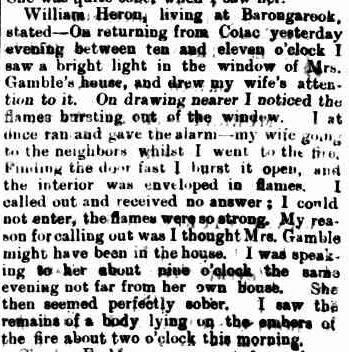 After the official witnesses, members of the public where then called, the first being Barongarook man William Heron. He and his wife were travelling home from Colac around 11pm on January 24 when he noticed a light in Ellen Gamble’s window. Interestedly he had seen Ellen at 9pm and to him, she appeared completely sober. 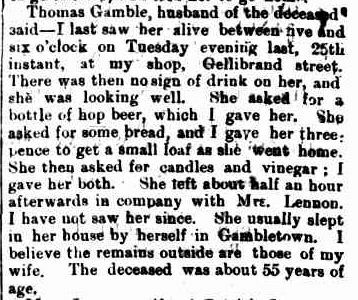 Thomas Gamble had a greengrocer’s shop in Gellibrand Street, Colac. Ellen had visited him at the shop on January 24th, a visit which seemed more like that of a shopper not a wife. It is not clear if she paid for the items, however she requested vinegar and the very objects that helped contribute to her death, candles. She also wanted bread so Thomas gave her 3 pennies to buy a small loaf on the way home. After a drink of ginger beer she left with Mary Lennon who had also been in the shop. Thomas noted that Ellen appeared sober then, between 5 and 6pm. Mary Lennon in her evidence also said she thought Ellen appeared sober. George Gamble then gave his evidence. Ellen had wanted him to drink rum with her but he declined and Ellen went home. Finally evidence from George’s wife Mary-Ann including reference to Ellen’s grand-daughter Mary Ann as mentioned in A Tragic Night. She was lucky she was not also burnt death with her grandmother. It’s great to have the Colac Herald online at Trove, but I hope I find some good news stories about my Gamble family soon. Currently my Electronic Friend is sending me stories of Ellen’s court cases with the most recent from her 33rd appearance before the Colac Police Court. 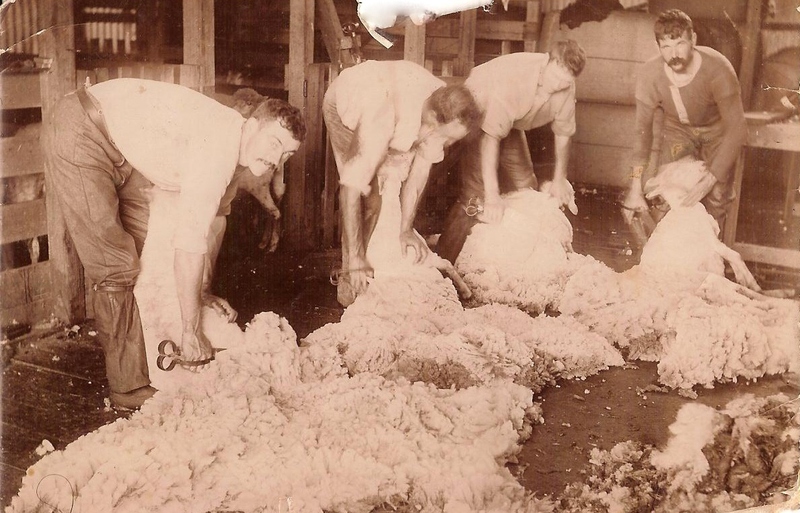 This entry was posted in Gamble and tagged Colac, Gamble. Bookmark the permalink. ← Trove Tuesday – UFO Alert! 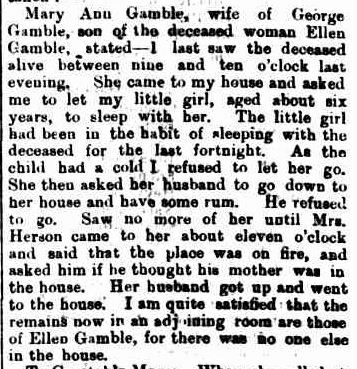 Being .05, we can assume her death was not as horrific for her as for us, but the wider story tells us a lot about 1880’s lifestyle in Colac. Bread and vegetables could be purchased at 6pm on a Tuesday, and the Herons were clip-clopping toward Barongarook in the pitch dark at 11pm. The poor grand-daughter was probably supposed to keep an eye on Gran and her rum (until catching a cold saved her the duty of it). 130 years later though, people are still knocking candles over and causing housefires. You’re a terrific researcher MR. Thank you Ann for your comment. You always give me a different side of the story and you are right, Mary Ann probably had been keeping an eye on Ellen. And, yes, I don’t think Ellen would have known much. I thought of the Herons too travelling so late in the dark. I wonder what time they got home? what time? more like what day. I know that area very well. they had to cross the Barongarook Creek twice in the pitch dark, and at the second crossing (12 kms from Corangamite Street) it is at the bottom of a steep decline and then rise. their poor horse. Thank you Frances. In George wife’s statement she confirms the remains lying in the next room of their house were that of Ellen. Given the state of the remains, having in them house, let alone having to identify them must have been horrific. sad story. Ellen was certainly an interesting character. Ellen was very interesting. One time that she was picked up for d&d, she said she had a cold, so she thought she would have a bit of a tipple, all said in an Irish accent. Thanks for your comment Catherine. It is possible she wasn’t drunk although her track record probably didn’t help the finding. Given she had at least 33 appearance for d&d in the Colac Police Court, it would have been easy for the coroner to hand down the finding he did. Pity they didn’t have toxicology reports in those days!